The ANNUAL DINNER MEET, Tyn-y-Coed Hotel, Capel Curig. You might think this was the "event of the year" but tastes have changed and only twelve members and guests sat down to the evening meal. The weekend started early for Stuart and Liz who take advantage of the warm, dry conditions existing on the Friday. With the sun out and very little wind they decided to visit the Dinorwig slate quarries to do some climbing. Stuart led their first route “Seamstress VS 4c” a three star classic which is an entertaining thin crack up the face of the Slab in the Serengeti area. In this area “Neat arete VS 5b” was also climbed which has a series of tough moves at the start but is a worthwhile route. They also visited ‘Never never land’ Stuart led again, “Hawkeye F5c” a delightful route on great rock before the last two routes of the day “Tomb raider F6a+” and “362 F5c” fine multipitch sport routes which proved to be brilliant adventures. Friday night, most of the guests arrived at the Ty-y-Coed Hotel. A fine time to socialise and work out the best climbing plan for the Saturday. The "Beast from the East" was blowing and the hills were coated with a thin coating of ice and snow. 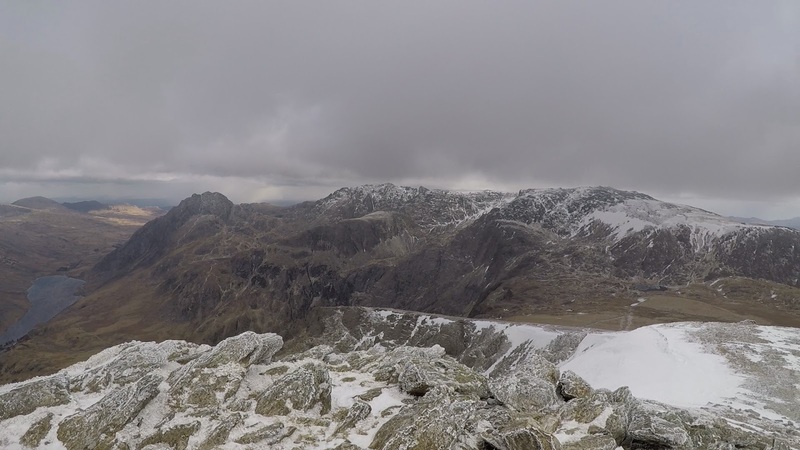 Tryfan would be dangerous so we opted for the Gribin ridge which for the most part would be sheltered from the biting wind. Dave leading the team up the Gribin Ridge. The ascent went well and ropes were not needed. At the top we turned towards Glyder fawr keeping the wind to our backs. 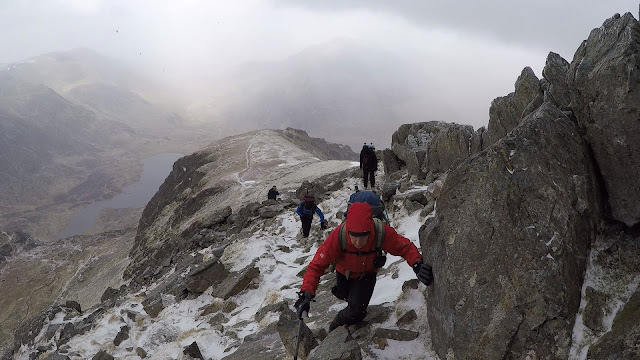 The descent down Glyder Fawr was rather tricky - the scree was frozen and potentially slippery but there was a long slope of snow in perfect condition for the ice-axe to grip. 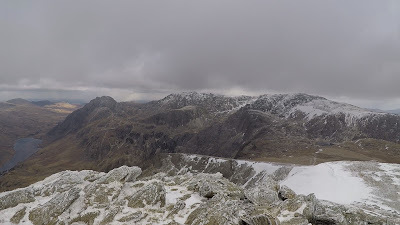 We expected the normal descent by the Devil's Kitchen track to be covered in ice (verglas) so we thought that a safer descent might be made down the north-east ridge of Y Garn. Stuart and Dave braved the icy blast at the start of the route but others refused the invitation to follow as the wind blowing back was monstrous. So it was back to the Devil's Kitchen track for the many. Yes, some verglas where extreme care was needed but not as bad as expected. The Dinner went well. Chairman Jeff Dodwell presented the Annual Awards, which was followed by two slide shows: previously unseen photos of climbing Mera peak; and a traverse and rock and ice climb of Mount Kenya. It put down 6 inches of snow overnight. Before the snow plough had come through you couldn't tell where the road started and the pavement began - a magical sight. The team decided to blaze a trail to Llyn Crafnant because the route starts immediately behind the hotel. 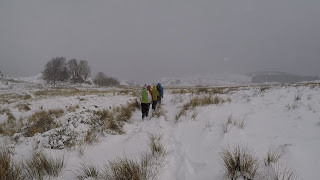 The wind had eased but out on the open moor compasses and maps came out to try to find the path in this snow covered wilderness. A team effort was required as the heavy snow fall had obliterated all trace of any paths. Eventually we found the main path to Crafnant where most of the snow had been blown off the path. Lovely views of the lake and even more magical views in the forest path over towards Llyn Geirionedd. A lovely easy walk and we were back at the hotel for 2:30pm. A diversion from the main path blocked by fallen trees. 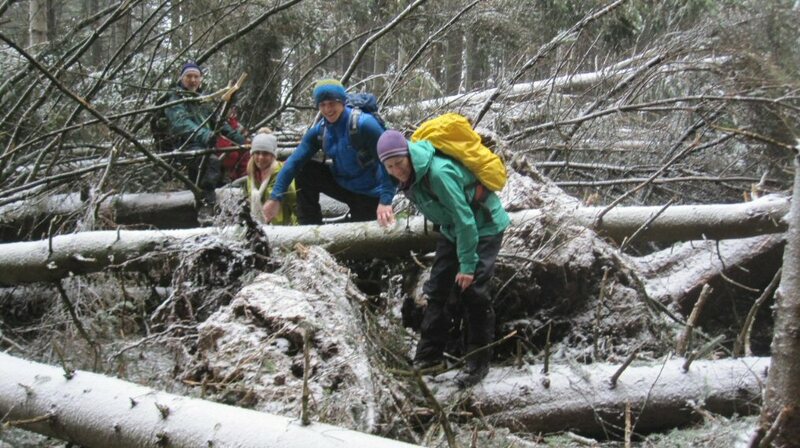 Gail Craven leads Stuart Hesketh, Liz Harrison, and Ian Craven through the forest of debris. This meet took place when there was still lying snow on a typical winter day. The path up to Longridge Fell was often blocked by fallen trees almost certainly brought down by "The beast from the East" the previous week. But we are a Mountaineering Club, not a set of ramblers, so we found a weakness in the forest of fallen trees and treated it as a challenging rock climb using inventiveness and determination. It was great fun acting like a child again. The lovely views of the Trough of Bowland from Spire Hill were not to be - everywhere was covered in mountain fog and it was snowing heavily. Food and drink at the New Drop Inn was as comfortable as ever in the snug bar. The return to Hurst Green seems to follow a constant east bearing but the paths are so complicated in this region the compass and map had to be our companion throughout. 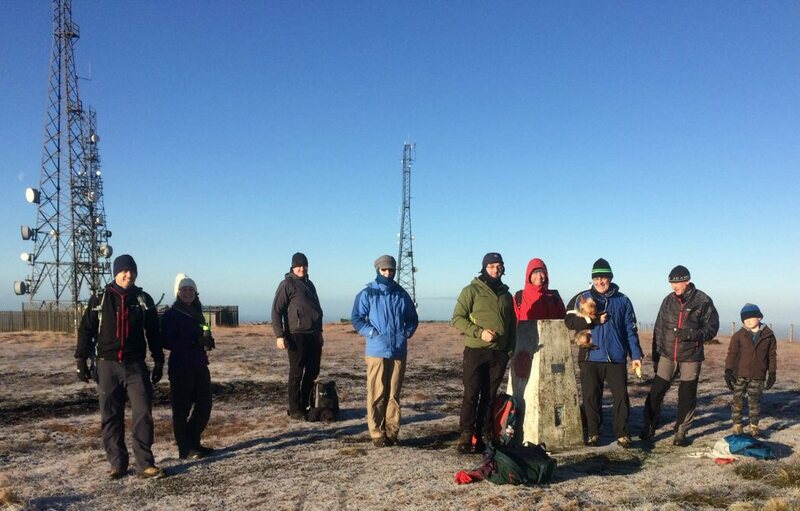 Our last summit was Doe Hill before returning to Hurst Green. The wake of the ‘Beast from the East’ had left Wales frozen all the way down the roadside. Simon, Lee, Stuart and Chris made plans to exploit the conditions and climb the Idwal stream. They climbed in two teams, Stuart and Chris followed by Simon and Lee. 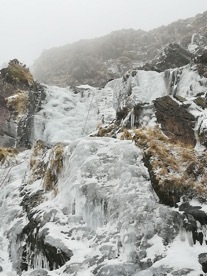 The route was well frozen with brittle ice in places. Stuart and Chris climbing on alternate leads. Simon led most pitches with Lee leading two of the easier pitches to accomplish his first leads on ice. For the upper sections both parties moved together. A busy excursion with very social belays it seemed most climbers had heard the stream was in. Descent was made via the Devils Kitchen path. Saturday morning at 6:45 a band of winter climbers emerged from their bunks and busily prepared for a snow and ice climbing day on Great End. At 8 a.m. they left the hut and journeyed to the car parking at Seathwaite. The objective was to climb Cust's Gully. As we ascended the light rain turned to sleet, then snow. The whole face of Great End was covered in fog but we could just about make out the start of Central Gully. Cust's Gully was known to be high and far to the right but in the mist it was difficult to make out anything distinguishable. The trek was easy under the rocks but Cust's Gully was nowhere to be found. Checking the guidebook we decided that we were too low and a climb over steep rocky terrain to the next level shelf would be necessary. Eventually, after much searching, we found the narrow steep-sided gully of Cust's with the unmistakable chock-stone wedged in it. Here we split into three groups. Chris and Stuart decided to climb the grade III Window Gully. Ken roped up with Kieran and Phil whilst John, the other leader of the day, roped up with Simon and Lee to climb Cust's Gully. Snow conditions were not firm but there was enough purchase on the boots to allow us to move together as two teams. A small rock pitch under the chockstone gave a difficult pitch where a permanent belay was made. The final steps out of the gully were relatively easy. We waited on the summit for Chris and Stuart, in total white-out. Eventually we heard a faint whistle and they joined us in the shelter of some rocks. 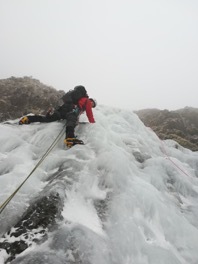 Their climb had involved a tough pitch of mixed ice and rock in lean conditions, lead by Stuart and giving Chris his first taste of grade III winter climbing. After a month of frustrating conditions it was fantastic to finally feel the crampons and axes bite into real ice. The descent in the cloud was far from easy. Ken was armed with map and compass which gave a good, safe line of descent but the compass then led us uphill for too long. Something was wrong. John checked our position on his new navigation gizmo and decided we were starting the ascent of Esk Pike. A quick turn-around brought us to the branch off to Esk Hause and a new compass bearing toward Sprinkling Tarn. The fog had descended still further and no features of Great End were now to be seen but at least it had stopped snowing. Down to Styhead Tarn where a mountain rescue man was quite rightly turning back young hopefuls wanting to climb Scafell so late in the day. Our descent then took us over the small scramble by Taylorgill Force, one of the highest waterfalls of the Lake District. The day was finished off with a communal meal of corn beef hash and fruit salad at the hut before going to the pub. over ice-glazed stones and a gradient that seemed to last forever. Eventually the bowl of Helvellyn became visible; one of Lakeland’s finest winter views. Red Tarn was surprisingly unfrozen. We roped up into three groups as before. Kieran had gone home to celebrate his father's birthday and his place was taken by Ian. The main groups chose the Grade I Gully 2 (as opposed to the Grade II Gully 1, confusingly) whilst Chris and Stuart plumped for a grade III route. The main teams made good progress at first but as the gully steepened conditions under foot were not good - 10 cm of soft snow covering an icy base. Both Ken and Ian tried to fit crampons on the steep icy slope in vain - they would have to kick and cut steps. The exit from the gully was particularly tricky, rising to about a 70 degree angle on uncertain snow, but the two axes helped a lot to steady the climb. Stuart and Chris made a successful ascent of V-Corner, a line of weakness up the buttress to the left of Gully 2, culminating in the tricky eponymous corner. Again, conditions were leaner than ideal but Stuart lead the first and third pitches boldly, with Chris succeeding on his first grade III lead on pitch two. They moved together on the upper snow slope to rendezvous with Ken and party on the summit plateau, with glorious views over the snowy fells. Ken chose Striding Edge as a descent because one of his team had no crampons. Striding Edge is longer but safer because Swirral can be lethal in icy conditions without crampons - there are no rocks to stop a fall, just a continuing icy slope to Red Tarn, far below. We got down to the Car Park at 5:30 as the light was fading on one of the most successful winter climbing meets ever and a pleasure to be with such an enthusiastic team. 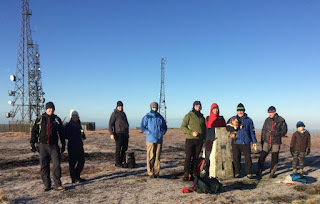 The walk was 6 miles from Rivington Barn up toward Belmont Road before a steady push to the trig point and the Winter Hill Mast (photo Lee Foster) . We then made our way to Two lads Stone, descending to Rivington Pike and into the terraced gardens with a slight detour to the waterfall. This was a well attended meet with Dave, Yvonne, Lee and son, John with Benji, Ian, Scott, Simon and daughter Rebecca.